Congrats and many hip-hip-hoorays to the newly-crowned success story of the immensely popular cable television event, The Next Food Network Star: Jeff Mauro, a charming and chummy 32-year-old private chef from Chicago with a penchant for sandwiches. Last weekend’s finale produced FN star number 8 in the series that over several weeks tests the cooking skills, patience, and personality of 12 contestants hoping for a shot at food celebrity status. Sandwich King Jeff got my attention fast, as sandwiches is by far my favorite food group. Not only do I love to eat sandwiches — for breakfast, lunch, or dinner — I love to make them and remake them as well. What with the popularity of Italy’s answer to the sandwich — the panini and its press — it’s no secret that sandwiches have come full foodie circle. It’s no longer just a PB&J (peanut butter and jelly) or boring-turkey-on-white-with-iceberg-lettuce world. As King Jeff said in the Food Network Star finale, he will show us how we can “turn any sandwich into a meal and any meal into a fantastic sandwich.” It’s a challenge we’ll be learning more about as Jeff’s prize package — a Food Network show of his own — develops and subsequently enlightens home cooks everywhere. I’ll definitely be watching. One of my favorite sandwiches from my past was a triple-decker delight that I ordered at a local coffee shop my grandma and I used to frequent when I was a teenager. You know the kind of place, where your milkshake comes to your table in a tall glass — with a bonus serving still in the frosty metal container that created the frothy goodness. This typical diner was a colorful but casual spot where we went once a week so we could catch up and she could get out of her small apartment for awhile. Unfortunately, I don’t remember much of what we discussed at our early evening dinners, but I do remember what we ate. Grandma always ordered a hamburger — and when its preparation took more than six or seven minutes she always threw out the same joke: “What’s taking so long? Did they have to go out and kill the cow?” I always laughed. And I always ordered the triple-decker grilled ham and cheese with fries. I remember my sandwich came in four beautifully cut triangles, standing on end like little sandwich soldiers, pointing the way toward the towering pile of thin-cut fries in the middle of the plate. My sandwich was made with plain white bread griddle-toasted golden with butter, and thinly-sliced ham and American cheese. Sounds a bit boring, but it was thick and hot and gooey with plenty of melted yellow cheese, and the triple-decker presentation more than made up for any lack of creativity in the sandwich fixins’. Today, I tried to recreate that delicious sandwich of my past, searching for that familiar taste of home and family — with a little bit of tweaking here and there. The finished product still had the ham, but for the cheese I used a combination of Swiss and sharp cheddar, and for a little extra zing I added sliced grilled red onion, pineapple tidbits, and honey mustard. Oh, and I put it all between toasted sourdough rye bread just to bring it all together. Sadly, I didn’t quite get there. Something was missing. I tried to update the sandwich to give it more of a trendy, over-the-top decadence, trying to pump up the volume on a Plain Jane lunchbox usual. But it didn’t work. Oh, it was a good sandwich, but it didn’t take me back like I thought it would. Maybe I should have stuck with the basics — white bread, American cheese, ham. Period. Or, maybe what was really missing was Grandma. Maybe that’s what made the meal so memorable for me so many years ago. It wasn’t the triple-decker delight or the pile of fries. It was the person sitting across the table making the same old joke about her tardy hamburger. Who knew memorable could be so simple? Grilled sandwiches can run the gamut from simply cheese to a pumped-up panini with a Mediterranean flair. That’s the beauty of the gem that is the sandwich food group. Like a big bowl of undressed pasta, it is a blank canvas. Here is one of my versions of a grilled sandwich; have fun creating yours. Melt the butter in a large, non-stick pan or griddle over medium heat; place the bread slices in the pan to start toasting. Sprinkle half of the cheddar cheese over one slice of bread and sprinkle half of the Swiss cheese over another slice of bread. (The third slice of bread is there just to toast on both sides.) Lay the ham slices in the pan for a few seconds to heat up, then divide them between the two bread slices, covering the melting cheese. 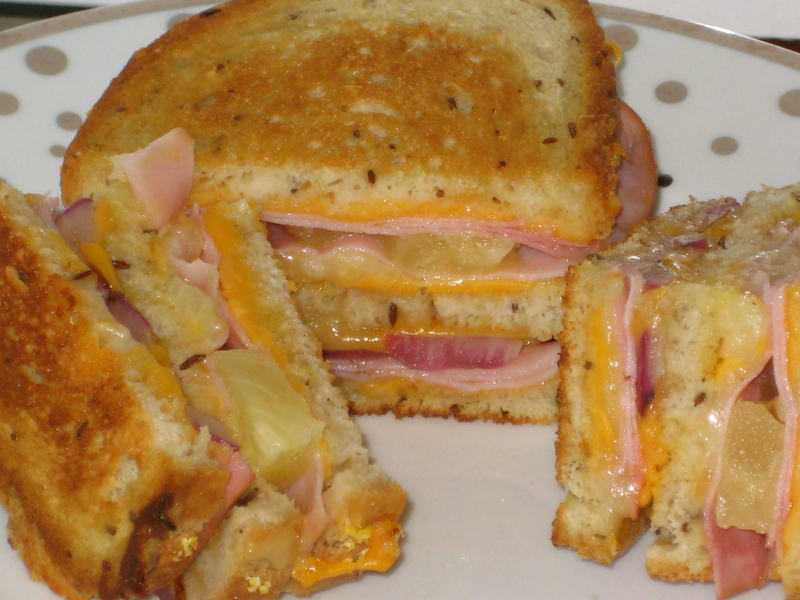 Next, place the grilled red onion rings on one slice of bread, atop the ham, and follow with the pineapple. Then place the unadorned single toasted bread slice on top of the pineapple, spread a desired amount of honey mustard over the blank bread slice, and sprinkle the remaining cheese over that. Finally, carefully turn the other half of the sandwich over onto the taller half and press down slightly to bring everything together. Continue to grill another minute or two to make sure all cheese is melted. Remove from the pan and allow to set for another minute before cutting and serving. This entry was posted in Comfort Food -- Savory, Entrees, Sandwiches & Paninis and tagged cheese, diner, Food Network star, grandma, grilled, ham, king, memorable, rye bread, sandwich, triple-decker. Bookmark the permalink. 5 Responses to Long Live the King! So I re-pinned this picture onto my pinterest because it looked so yummy! And TODAY was the day I decided to make it! From the moment I got to work, I’ve started all my conversations off with Let me tell you about my grilled cheese. And everyone is riveted! (seriously, people’s eyes lit up when I told them the ingredients) One of my co-workers even came down to see it at lunchtime. I have to admit, mine didn’t come out as beautiful as yours, but it was amazingly delicious! So thank you for the idea! I think you should re-invent all food. And I will be waiting to see what you come up with next! Glad you enjoyed the grilled cheese! You may now find your coworkers following you into the lunchroom every day! Thanks for visiting and commenting. I LOVE grilled cheese with apple. Now Im vegan, but I just use vegan cheese and gluten-free bread. SO good. Im a big fan of the apple, cheese, carmelized onion combo as well. But avocado and bacon (veggie bacon for me!) sounds out of this world.